A well-watered and nutrient-rich yard is a happy yard. It’s hard to put our finger on it, but healthy, green grass just looks good on the eyes, as do other plants and yard elements. At the end of the day, you pay your local sprinkler repair company in Toms River good money to upkeep your home’s irrigation system not just to uphold your property value, but because an attractive, inviting yard is something worth having for you and the entire family. Take Proper Care of the Yard That You Deserve! Without a healthy and functioning sprinkler system, however, your grass will begin to suffer in the heat of the summer sun. Perhaps you’ve stubbed your toe on a corner sprinkler in the yard that didn’t go down when it should have, releasing a series of colorful expletives from your vocal chords. Maybe your new puppy decided to get rowdy in your yard and brought you a sprinkler head fresh out of the ground, expecting you to proudly place it on your mantelpiece. 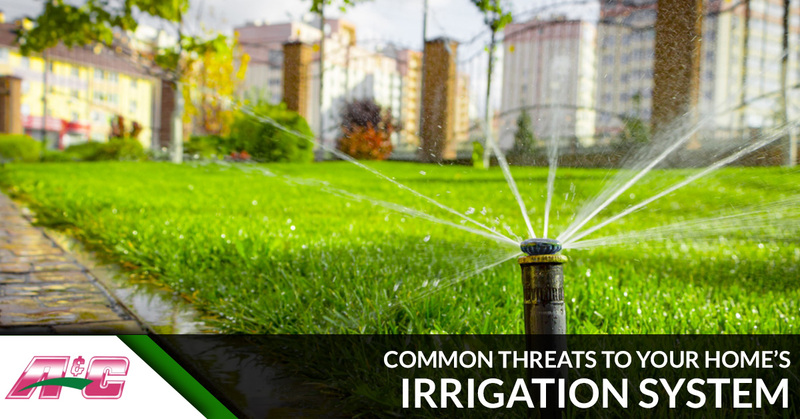 In any case, your home’s irrigation is subject to a number of threats. If you’ve discovered that your sprinkler system isn’t doing what it should be doing, your Toms River sprinkler repair experts are on the job. With speedy and courteous service in mind, we’ll do everything in our power to make sure that your yard enjoys an irrigation system that uses water efficiently, effectively, and is dispersed evenly throughout your grass and plants. That’s how things should be, and we wouldn’t have it any other way. Read below as A & C Sprinkler gives you some of the most common threats to your sprinkler system, and contact us immediately in the event that you experience any of these misfortunes. Let’s get started. The cold temperatures of winter are harsh and unforgiving unless you live in a boring area of the country that doesn’t experience the magic of four distinct seasons. It’s worth enduring the bitter winters here in Toms River to get other, more pleasant seasons, but you’ll want to protect your sprinkler system when things start to get consistently chilly. Sometime during the idyllic fall season, make sure to put down your pumpkin carving tools and inquire about our sprinkler blowout services. You won’t regret it, but you will regret not getting your sprinklers blown out when your pipes eventually freeze and you’re left with thousands of dollars in repair bills. Yes, the irony is strong with lawn care. The very tool that you use to keep your grass healthy, trimmed, and looking good is also the tool that can make things worse. Though sprinkler heads generally tend to be in the corners and along the sides of your lawn, larger areas of grass have sprinkler heads near the middle. When they don’t go down all the way — as they’re designed to — you might have a frustrating and cringe-worthy problem on your hands when you unknowingly go to mow the lawn. A & C Sprinkler can easily fix any sprinkler heads that aren’t going down (or, conversely, popping up) as they should. It’s up to you to give the grass a quick visual inspection before mowing it to remove any rocks, debris, or take note of any protruding sprinkler heads. Like any sane human being, we love and appreciate the gift to the world that dogs are. Truly, they are a beam of light and positivity in an otherwise bleak and sad reality. While the unconditional compassion and support that dogs provide proves that they mean well, sometimes an excited puppy or riled-up dog can end up leaving your sprinkler heads looking something like this. No one wants to blame a broken sprinkler head on something as innocent as a loving dog, but it happens. You can train your dog not to chew on sprinkler heads, which should have receded back into the ground as they’re originally designed. Otherwise, consider A & C Sprinkler on the job (not to train your dog, but to fix your sprinklers). We’re here for you, and we want your irrigation system to be there for your yard. Give us a call today for speedy and reliable sprinkler repair services!